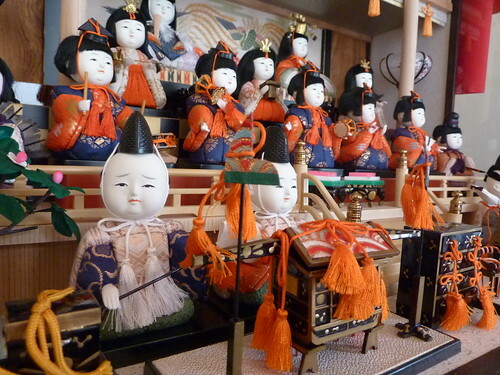 Yesterday was Hina Matsuri known in English as Girl’s Day or more literally Doll Festival. 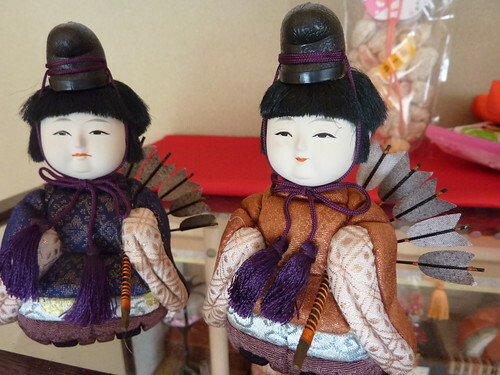 This Japanese holiday celebrates girls and protects them from evil spirits and bad luck for the coming year. 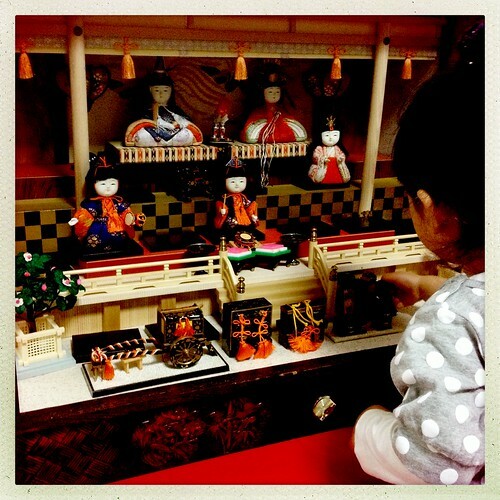 The centerpiece of the holiday is setting up an elaborate display of dolls that represent the court of Heian Era Japan. This was my daughter’s third year of celebrating it and the first one in which she was old enough to be able to help set up the display. This set belonged to her mother. She tells me that she was a bit embarrassed by the small size because most girls had large displays that filled the living room. But I love this one because the glass case has a built in music box that plays the Hina Matsuri song. Moka enjoyed winding it up and singing with her mother, aunt, grandma and great grandma who is now 93 (!). That’s four generations of women and girls. When I listen to them sing together, I think of how far women and girls have come in society. Great grandma Hisaye was an aspiring big city show girl who fled to a village up north during the bombings of WWII. She was arranged to be married to a poor but hardworking farmer and worked the fields for over 50 years while raising four girls. The second oldest, a dynamic spark plug of a woman and probably my favorite in-law, was handed over to Hisaye’s childless older sister. Those are just two of the stories of the women in my daughter’s life. Girls have come a long way. On the other hand, there’s another holiday called Children’s Day, which actually celebrates only boys and is a national holiday. Meanwhile, no one takes a day off for Girl’s Day. So girls can go a little further, I think. This day is known as the day the swallows came back from Gangnam and the day the snake came out from its winter sleep. 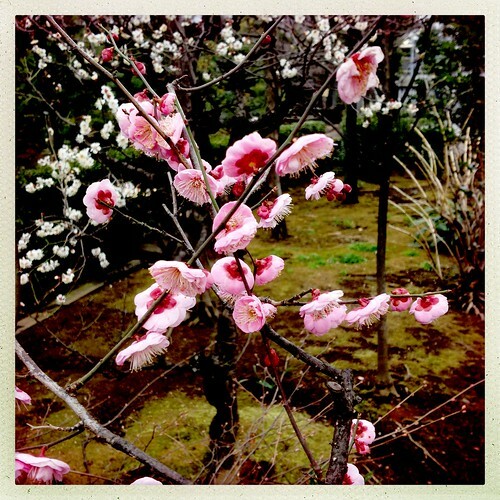 It is also the day birds and butterflies start to appear. And thank god, because it has been a long cold winter. 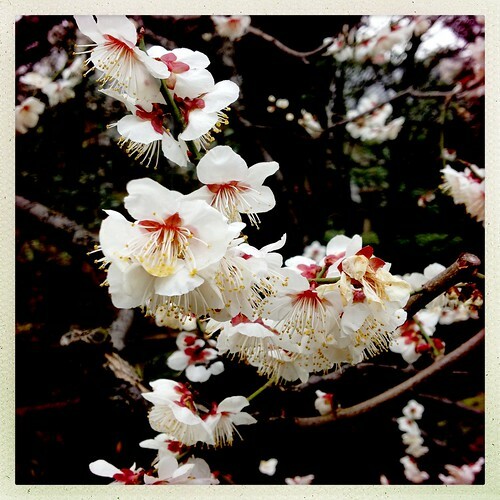 So I leave you with the first signs of spring this week, plum blossoms at a nearby temple.